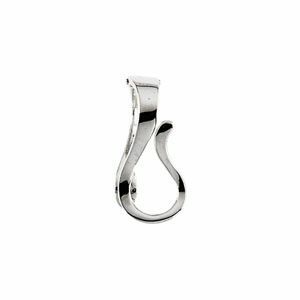 Description: A contemporary designed 14k yellow or 14k white gold hinged pendant hanger bail that can be attached to an Omega or any large round chain which a pendant can be easily interchanged. This type of item works well when you want to change pendants frequently. Measurements: Outer dimensions of the bail are 3.7 mm wide at the top of the hinge by 17.5mm in length. The inside diameter of the chain opening is 6.75mm wide by 9.5mm lengthwise. 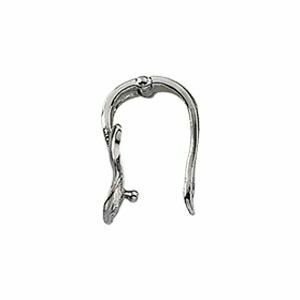 The 'J' shaped hook is 2.0mm wide at the top which will accommodate bails with an inside diameter opening of 2.0mm and greater. 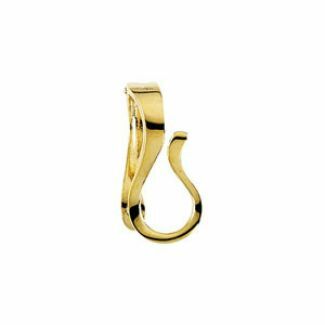 The opening of the hook is 5.0mm but it is best to use with a bail width under 4.0mm wide.